There’s a short window in many young women’s lives—after they are primarily daughters, and before they are primarily wives or partners or mothers. I think about this period of time a lot, maybe with similar fascination that the photographer Sally Mann had with the age of twelve for girls. It’s a transition from one you to another you, and we can learn a lot about womanhood by gazing into this window. It was during this window that my grandmother worked as a secretary in downtown Honolulu. 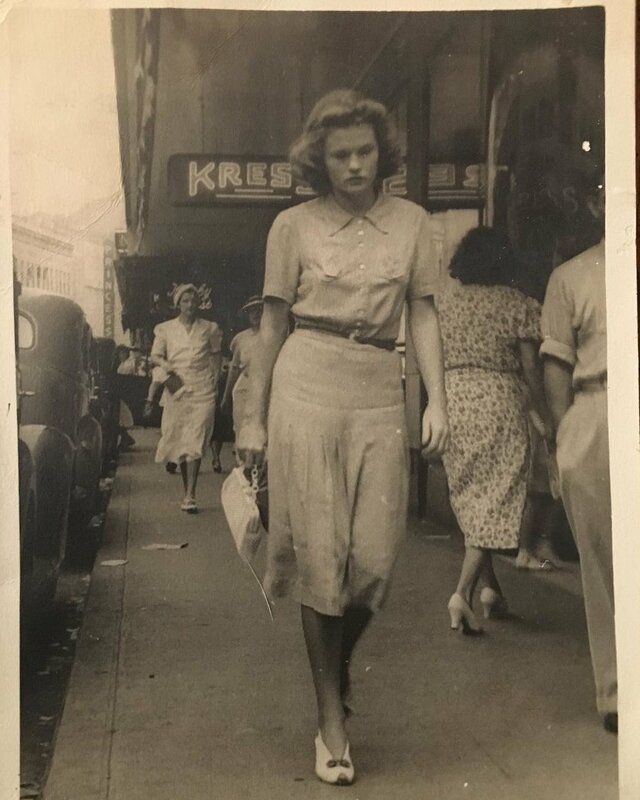 She looked like Katharine Hepburn in a photo I have of her—casually glamorous—strolling down the street in Chinatown with the lei shops behind her. 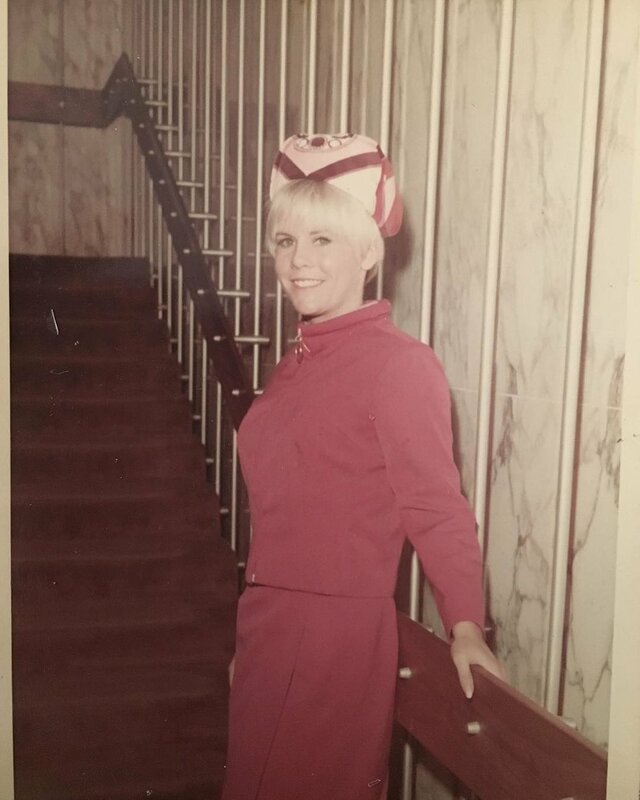 It was during this window that my mom was a Braniff stewardess, wearing Pucci in a photo—a fuchsia dress, paisley hat, and white knee-high boots—about to board a flight. My mom met my dad on an airplane. He was in the Navy, and the plane was headed to the Philippines. She was 21 when they met and 24 when they married. I recently found a short journal of hers from when she was engaged and preparing for marriage while my dad was serving his final Navy tour in Vietnam. The journal was half diary, half letters to my dad that she never sent. In it, I saw for the first time, a woman who wasn’t sure if she wanted to end her window after all, a woman who didn’t want to quit her job and hang out with other wives, who felt afraid to be Mrs. anybody, but who nevertheless felt that she had no choice over who she must be once she got married. And maybe everything she feared about marriage was a better choice than continuing to do weekly weigh-ins and be constantly harassed and have to keep a smile on her face at work. The time was creeping closer where she would be too old for her job and for a fun, young husband with career promise. It was now or maybe never, in her world. Or at least, that’s how I imagine the choices must have been. I’ve never talked with her about it. During my own short window—which ended when I was 20—I partied a lot, did a lot of drugs, had a lot of flings, and then quit all that to work at an elementary school aftercare program while taking classes at the local community college. I never really stopped to live in the window and value it. I wanted the window to be over. I partied and did drugs to escape my uncertainty, and then I turned toward trying to find a way out of the window. I thought I wanted to be a teacher. I loved kids, and I wanted to get married and have kids, and I thought that a teacher’s schedule would be ideal as a parent to four kids—two boys and two girls. Anyone who knows me now would probably laugh at that idea, but it’s what I thought I wanted back then. But I wonder now how much of those desires were simply borne out of conditioning, out of a lack of confidence in my ability as a powerful leader with a thriving career, out of a longing to belong as I never felt I had in life thus far. Sometimes I wonder if my discomfort with this window of individuality led me to be careless when choosing a partner (twice). I looked for signs from God more than I looked at character and consistency. It’s nothing I can regret now because my kids are here—two girls, #blessed to not have anymore, thanks; and I am glad to have spent many years with my ex-husband and still be friendly. But now I wonder about my daughters’ windows. Tania is 19, and in her window. She still lives with me, she’s still a daughter, but I think that her primary role right now and the one that she wants is Tania, a young woman who is finding her path and discovering who she is. I hope that she feels grounded and connected to her family. I hope that she doesn’t have a deep hole in her heart that she longs to fill. But I fear that she does, and I fear that she will choose unworthy partners and fail to make bold decisions about her future career. And I guess that won’t be the end of the world—it’s never too late to change course—but I wish I could save her the heartache of making decisions that aren’t in line with her true self. She’s in a stage of life where she thinks everything I say is stupid and that I don’t know anything about life, so she’ll have to learn her life lessons without my input. I thought my mom was an idiot too, when I was Tania’s age. I have a lot more respect for her now that I’m mature enough to see a bigger picture. There are things that I wish I had listened to her about, and things that I don’t regret not listening to her about. But she’s not the completely clueless housewife I once thought she was. She’s a woman who is very smart, who chose a role that was available to her at the time and was considered to be a superior role for women. And that role became her identity. I never felt grounded or connected to my family. I felt like an outsider, an inconvenience, a mistake. I did not share interests or world views with my family. And I ultimately felt like I desperately wanted family I could connect with, but had so little control over what family had been for me. From early childhood abuse, to fleeing my biological father, to my biological mother dying, to being adopted, to being a gifted weirdo with untreated trauma who didn’t fully know how to socially interact, to being bullied, to being sent away by my parents to an abusive religious environment, to having various mental illnesses and addictions in my family that continue to be undiagnosed and untreated—I had no control over any of it. When I got pregnant with Tania at age 20, I think I felt that I could finally have control over my experience of family. I wanted to be the ultimate mom. I totally ignored all of the problematic behavior of my daughter’s father as I cooked every single recipe and made every single Christmas ornament in the Martha Stewart magazine when I was pregnant. I believed I could cook and craft my way to connection and happiness. But I had to leave when it became clear that he had addiction, mental health, and violence issues that he wasn’t going to get real help to deal with. (He got help about 15 years later, and seems to be doing well, but he missed out on some beautiful years with Tania.) Once more, my grasp on family was out of my control, but I did my best to build a life for Tania and me. I got my B.A. I went to law school. I met another man, and the temptation of building my own family took me over and I was married and pregnant in my final year of law school. And then I had that for a long time. I let it be the thing that defined me. I let it be my identity—Married Mother of Two. I served the master of Married Mother of Two, and in order to do that, I had to give up so much. I had to make myself so small that I could fit in my husband’s pocket, only ever to be retrieved when I was needed, like a handkerchief, or a wallet-sized photo, or a debit card. My life was filling everyone’s cup but my own. And sometimes I would become unhappy. I was neglected and mistreated in my marriage, but I would keep it to myself for as long as I could, only ever writing about my feelings in a journal. At times, I wouldn’t be able to contain my angry feelings of injustice and loneliness, and I would explode. This led to a period of shame and contrition for me as I tried to return to the shell of a person I needed to be to make everything work. I even threw journals away and started new ones, so that the new one wouldn’t have any negativity in it. I believed that I could positive-think my way into a happy marriage, and that the unhappiness I felt was the result of my own negative thinking. After all, this was my second failed relationship. I never blamed anyone but myself for my problems. Eventually, it all fell apart. I was either going to grow or die. And when I grew, I outgrew my marriage and I outgrew the idea that Married Mother of Two was my highest value. Then I fell apart completely and had to do the hard work to piece myself back together in a way that made sense. Having a marriage to focus my unhappiness on had made it so that I never had to confront the true sources of my unhappiness—unresolved trauma, the masks I wore for years to be a woman who could hold everything together, and a deep hole that I looked to others to fill. I then had to confront my childhood, confront the monsters in my life, confront myself. I found myself in the belly of the whale for many moons. It was a new window—the one that had been postponed because of the decisions I had made. It was a window of time where I had to get to know myself again, heal old hurts, and decide what I wanted from myself and from life. As I write this, I wonder if the fixation I have on that window of early adulthood is simply another way for me to avoid the window that I find myself now inhabiting. Because it is lonely and exhausting here sometimes. I can no longer sit in the satisfaction of checked off boxes—marriage, kids, career, beautiful home, vacations, all of the markers of adulthood. I now sit with new checked off boxes—divorce, single motherhood, small but cozy rented home, two dogs, teenager who thinks I’m an idiot, 12-year-old who still thinks I’m cool for now, a career that I struggle to maintain and find joy in, and most nights spent alone. Well, with my dogs. And so now that I find myself within a new window, I take my own advice—or at least I try to most of the time. I have a pen. I have work. I have the money that I have. I have love. I have health. I have happiness. I have today. There is no rush to get to tomorrow.